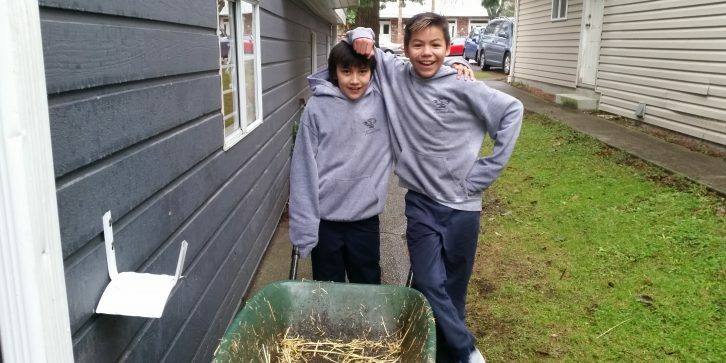 As a Catholic School, we are always looking for service opportunities for our students. There are many such options within our school, such as watching the younger grades, monitoring the office phone, and even organizing events for the younger students. Occasions such as Sports Day, Penny Carnival, and 100 Days of School are all student-led and organized! However, the service opportunities that present themselves outside of our school’s walls are often the ones that are the most meaningful to our students. In the past, our Grade 7’s have attended The Door is Open and the Summerhill Senior Residence. This year, a new opportunity presented itself. A Grade 7 parent (Mrs. Linkari) asked Mr. Dotto if the Grade 7’s would be interested in coming to visit Cascadia House in North Vancouver. The mission statement for The Cascadia Society is ‘to make a contribution to society by creating opportunities for people of all abilities to fulfill their potential through living, learning and working in community.’ Specifically, they are a community that includes adults with special needs that can work, live, and learn meaningful skills. To have our Grade 7 students spend some time in such an environment is something that Mr. Dotto knew could have a lasting effect on the outlook of our Grade 7 students. Here is one Grade 7 student’s account of the day. Thank you for the write-up, Adelina! Have you ever heard about Cascadia? We hadn’t either, until our teacher mentioned it to us one day. Mr. Dotto had some employees from Cascadia come over and explain to us what it is all about. Cascadia is a community made up of special homes where developmentally disabled people reside and do many great and fun activities together. In joining the community for the day, we were given the choice of multiple activities: weaving, pottery, basket making, home skills and candle making. Mr. Dotto placed us in groups, and the next day we were all ready to go. The following morning all of us were excited to go to Cascadia house. It was going to be fun spending a day out of the classroom, but we were also looking forward to meeting the community members 🙂 Cascadia was a short walk from our school, so we didn’t take the school bus. On the way there it started to rain, but as a class we didn’t let a little rain dampen our anticipation. As soon as we arrived we were greeted by two friendly employees. Each student went into their arranged groups and we started our day. The weaving group got to use a loom and help some of thepeople there. Those who selected the pottery activity had the opportunity to make a plate and a cup. The assigned group for basket making cut down Willows and created the base of the basket. The home skills people were shown the kitchen equipment and learned to make cookies, which smelled amazing. Finally, the students who did Candle making used Beeswax to create their own candles. It was an amazing opportunity to learn a lot about the residents while working with them. By late afternoon we were all finished, and we started to head back to school. On the return walk, we talked continuously about the activities that day and the people we met. We are already looking forward to our next trip to Cascadia (Mr. Dotto mentioned that he’d like to plan another trip there before the end of the year). We never would have even heard about Cascadia if one of our classmate’s parents (Mrs. Likhari) hadn’t invited us there! If anyone is curious about Cascadia, you can learn more from the website. Check it out, and try to visit if you have the chance – you will learn a lot and meet some great people!